Our arrival in Bangkok is always going to be a bittersweet memory for me. My husband had managed to get me a used, unlocked iPhone for Christmas. 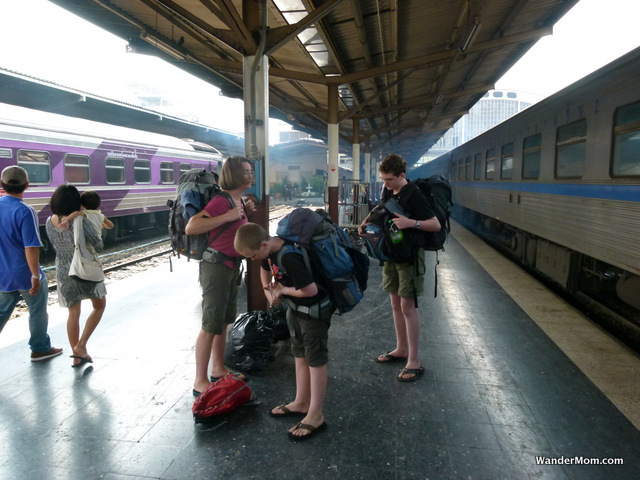 As we gathered our things after our two-day train journey from Kuala Lumpur to Bangkok I realized that the phone was missing. I’d only had it a couple of hours earlier. He was mad. I was mad. I felt stupid. Like I said, bittersweet. Thankfully we were able to get to our awesome Lub.d hostel pretty easily (i.e. without killing each other). He went for a nap. I took our kids out for our first wander in Bangkok. Given that we were based in the Siam Square area of Bangkok they were in teen kid heaven: there were malls, food courts, and familiar brands. Undeterred, I directed us to the nearest Buddhist shrine. For a day that started so badly, it was a fun afternoon. So we got ripped off in Bangkok. Since this seems to be a tourist rite-of-passage in South East Asia it was good to get it out of the way on our first full day in the city. After that the next two days passed in a blur of temples and tuk-tuks with a side of tourist shopping on Khao Sanh Road. Murph and the boys also found time to visit the Center for Venomous Snake Toxicology and Research (top of everyone’s list of attractions in Bangkok, I know) while I got to spend a morning at a spa – and we got visas for Vietnam and Cambodia from a little shop next to our hostel. Like any city, Bangkok has it’s lovers and it’s detractors, we’re all in the former camp. We thought we’d booked train tickets from Bangkok to Chiang Mai but when we turned up at the train station we got shuttled onto a bus to a dingy side street. South-East Asia, it appears, has entirely different rules for independent travel than South America. You really DO need keep your wits about you at all times. My temper was flaring about this cluster when the hostess came to shoo us on to the bus. I did a double-take: the hostess was a host with an ill-fitting wig but a convincing chest. OK so. Distracted, I climbed on and helped my kids find their seats. 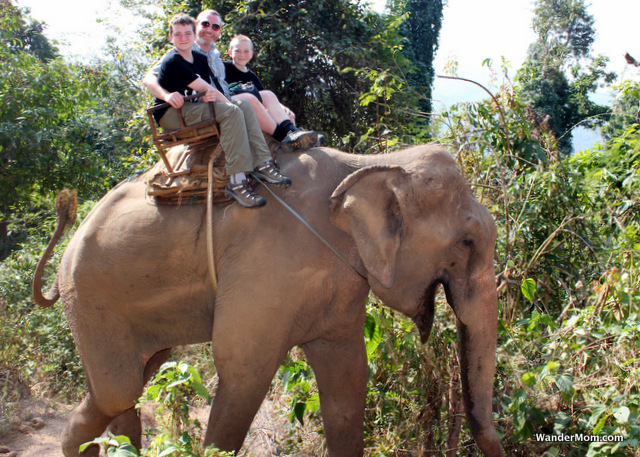 I detail our time in Chiang Mai in Five Days in Chiang Mai for $600 but as a quick summary: we rode elephants, took a cooking class, chatted to monks, did a cycling tour of the area around Chiang Mai and generally had an incredible time. Murph and I even got to have a date night where we had dinner at the very swish Rachamanka. It took almost a full day to travel by bus and minibus from Chiang Mai to Chiang Saen but it was worth it. 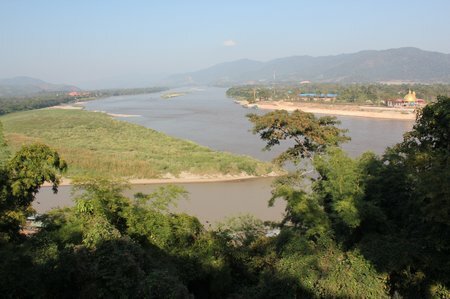 We didn’t have enough time to go into Burma but we were able to have dinner at a street side cafe at a bend in the Mekong where you can eat in Thailand but see Burma just across the river to your left and Laos across the river to your right. We spent a day exploring the Hall of Opium Museum and the next day continued on into Laos. 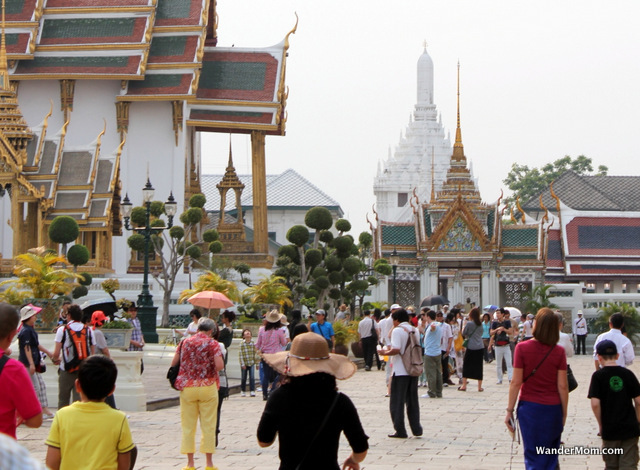 This entry was posted in Thailand and tagged Itineraries, RTW Itinerary, Thailand on January 22, 2013 by wandermom. It’s been a while since I’ve mentioned anything about the RTW trip which was one of my reasons for starting this blog – but that doesn’t mean that I haven’t been thinking about this trip. In fact, just the opposite. There’s some good news: We have an itinerary. London to Buenos Aires overland (and circumnavigating South America) to Santiago to Bangkok overland to Vientiane to Shanghai to Beijing (and as much of China as we can squeeze in) to Johannesbug overland via Namibia to Mazabuka Zambia and back to London. We have moved our start date from June 2010 to September 2010 to suit my husband’s work schedule. This is a good thing because it means that our trip plans are now all above board and have been discussed with employers. I’ve been blogging away since my first post on this topic a year ago and through this have built a network of friends and contacts in many of the places which we wish to visit. I’m excited already to meet these folks in person and very happy that we’ll be able to get input from locals on fun things to see and do. But, I have to come clean and say that we’ve been affected by the recession and the downturn in the economy. One year on, the impact of such shocking events are still an every-day reality for us and will be for some time to come. We’re approaching this as a known risk to our project but we’re continuing with our planning nonetheless. It has caused some changes in that now I’m planning in 12-week chunks. If we decide that an extended trip is not financially prudent for our family at this time, hopefully we’ll be able to leverage school vacations to for shorter visits to individual regions instead. 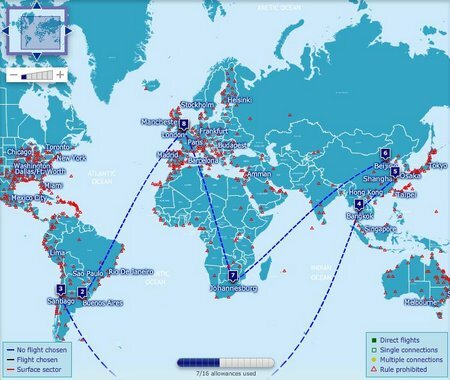 I used the One World Itinerary Planner to build the map above – simply because we have airmiles with a OneWorld airline which I hope to be able to use for our flights. Airtreks also has a neat RTW itinerary planner, but the most useful tool so far has been the City Guides on the BBC World Weather website. With charts, tables and graphs showing weather details by month for a long, long list of cities worldwide it’s a mine of information for any traveler. If you have any ideas for any of the places I mention above or anything relating to planning an extended trip – particularly as a family – do leave a comment below. This post is part of the Mondays Are For Dreaming series hosted by MotherOfAllTrips. Wander on over and check out some more family travel stories – or dreams. Like what you’ve read? Subscribe for updates via RSS, email or follow me on Twitter. This entry was posted in RTW and tagged family world trip, RTW Itinerary, Zambia on September 14, 2009 by wandermom.